During your initial consultation, your doctor will meet with you to discuss your diagnosis and treatment options. In some cases, surgery can be performed on the same day as the consultation. 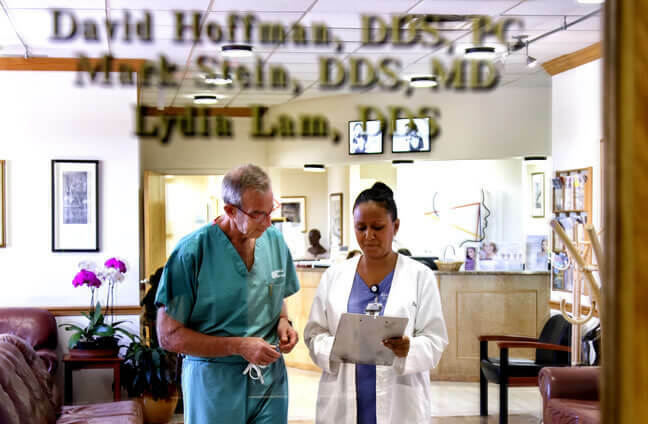 However, depending on your medical history and the complexity of your treatment plan, it may be necessary to schedule your procedure for a different day. A pre-operative consultation and physical examination is mandatory for all patients. If you are having IV sedation, please do not eat or drink 8 hours prior to your surgery. This excludes all daily medication which should be taken with a small sip of water. You will also need an adult to drive you home. Please alert the office if you have any medical conditions that may be of concern prior to surgery. These conditions include but are not limited to diabetes, high blood pressure, artificial heart valves and joints, or rheumatic fever. Also, please inform us of any medications you are currently taking, including heart medications, aspirin, or anticoagulant therapy medications. Your medical and/or dental insurance cards (if applicable) and the necessary completed forms. This will save time and allow us to help you process any claims. IMPORTANT: Patients under 18 years of age must be accompanied by a parent or guardian at the consultation visit. What if I already have X-rays from my dentist? If your dentist or physician has taken X-rays, please request that they be forwarded to our office. If there is not enough time, please pick them up and bring them to our office. Additional films can be taken at our facility, if necessary.